Two recent Apple articles offer solutions to potential problems with iLife software. Let’s take a look at both. If you use Mac OS X’s Archive and Install feature to update or reinstall your OS software, or if you use Migration Assistant to transfer your files to a new Mac, Apple confirms that you may be in for an unhappy surprise: Your iLife applications may not open any more. Each application’s icon will begin bouncing in the Dock after you select to open it, just as you would expect. However, the application never completes its launch. Either nothing happens or an alert message appears informing you of the failure. The solution is simple, if a bit time consuming: Reinstall the entire iLife suite (either ’08 or ’09) from your original disc. Next, use Software Update to move up to the latest versions, especially making sure that you install the latest iLife Media Browser update. All should now be well. 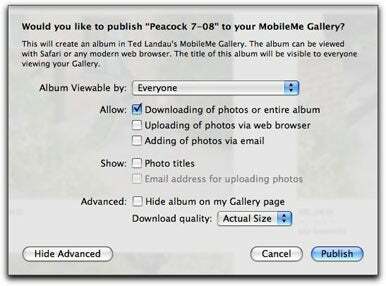 You (or more likely, a friend) may want to download photos from your MobileMe Gallery. If you’ve uploaded the photos via iPhoto ’09, Apple confirms that the downloaded files will be a smaller size than what you originally uploaded. This is true even if you selected Actual Size as the Download Quality when you first sent the photos from iPhoto. This smaller size compressed file may translate into noticeably inferior picture quality. What’s going on? Apparently, Apple didn’t exactly mean “Actual Size” as the Download Quality, despite using those words. What it really meant was the same resolution as the original, but in a compressed format. For those who prefer to have a true “actual size” version in the Gallery, Apple offers a partial solution: Update to the latest version of iPhoto. Photos uploaded to MobileMe via this version will have improved “compression quality” as well as a larger file size. For photos in albums that you have already uploaded, getting the improved quality will require that you delete the entire album, recreate it and re-upload it using iPhoto 8.0.2 or later. Even with iPhoto 8.0.2 or later, however, the photos are still not exactly an uncompressed actual size copy. If only a true original sized image will do, you’ll need to abandon iPhoto altogether. Instead, the solution is to upload the photos via the MobileMe Gallery Web application, accessible when you log in to MobileMe in your Web browser.